1. I use a heat gun to fuse, and am very careful to not over-fuse. The wax should not be blown around, or you will create a wavy surface. I’ve also read that torches can work well. 2. I use a wide (4″) hake brush to lay down layers of clear beeswax. The hake brushes are inexpensive, and have a fine texture that lays down smooth, thin layers of wax. 3. Scraping the surface from time to time with a razor blade will even out your surface and encourage subsequent layers to go on smoothly. If you use intarsia in your paintings, this will be a built-in texture regulator. 4. When I want to lay down a smooth layer, I turn the heat up on my wax slightly. Usually I keep it at 200 deg. F., but I’ll turn it up to 220 or so for brief periods. The hotter wax is more likely to smear color directly beneath it, so use this tip carefully. 5. If I am putting down more than one layer of smooth was, I alternate the direction of my strokes with each layer. I load my brush, keeping it nice and hot, then use one sweeping stroke to cover the entire width of the painting. Then I apply a stroke beneath that one, etc. When that layer is done I turn my painting a quarter turn, and put down another layer, etc. I fuse every two thin layers as I go. 6. 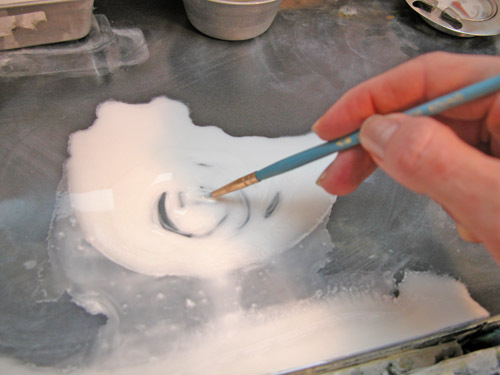 Many artists use a “pour” method for their paintings. They tape the edges of their painting to create a lip that comes up to create a clean edge. Then pour the hot wax onto the surface. The drawback is that this can melt and/0r pit the surface of any painting beneath the pour. This is worth experimenting with, though, as I’ve seen some really beautiful work done this way. 6. 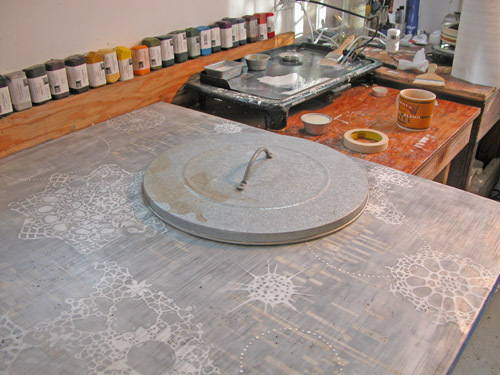 Some artists use a solvent at the very end to smooth the surface. You can put a bit on a rag and rub the surface. What I’ve noticed about this technique it that it creates a matte finish. The painting must be buffed periodically to maintain a glossy finish. 7. Which brings us to buffing. You’ve created your smooth surface, and you want to make it look glassy? Clean, lint free rags work. I like to use white t-shirts that I get from the thrift store, wash and dry, and then cut up. Another option is to use chamois, which is completely lint-free, and can work up a high shine. You don’t need anything but your buffing rag and some patience. Work on small sections at a time, rubbing lightly in small circles. This is a great way to “polish” your finished piece. What about you? do you have any smooth surface tips you’d like to add? Leave a comment, and add to the list. This entry was posted in beeswax, encaustic technique, painting and tagged beeswax, beeswax painting, encaustic, encaustic painting, encaustic technique, painting on September 8, 2009 by LisaK. Mmmmm. Beeswax. I just ordered 25 beautiful pounds of it from Swan’s Candle Making Supply. I’ve always ordered from R&F Encaustics (and their wax is lovely, too), but since I’m on the west coast, it’s great to have found a source here in California (and their customer service has been great- as I found out when I botched my initial order… ahem.). I also ordered some microcrystaline wax- I’m adding a small amount to my beeswax to improve the tack in the clear layers that I use so often. I’m blending in about 1/10 microcrystaline, and it does seem to be improving the adhesion of layers. This has been a concern of mine as my paintings grow in size. I often find myself trying to find a balance between adequate fusing and avoiding disturbing my layers. It’s a tricky thing. As you can see from the (slightly blurry) picture above, I’ve also adjusted my set up to accommodate larger amounts of wax at a time. I’m using a single burner with an adjustable thermostat, a small pan, and a thermometer. I’m finding that I really have to keep an eye on that thermometer! I used to melt smaller amounts in the small bread tins you can see on my palette, above, but it takes 45 minutes to melt a batch, or longer if it has damar resin in it, and I’ve needed more than that at once. I tried using a crock pot, but found that the temperature was unreliable, and that having it sit for long periods of time melted eventually turned my wax a deep amber color. I ruined quite a lot of wax that way. So far, this is working great- the only downside is that if a drop or two gets on the burner, it smokes up the studio, and reminds me that I really need to get fans in there and stop relying on my windows for ventilation! The next thing I want to try is a torch for fusing. I’m hoping that it will speed up my process a bit. If anyone has a favorite torch, I’d love to hear about it… fewer people use torches for fear of lighting things on fire, so it’s harder to find recommendations, but I’m looking for one that is not too heavy, and has an adjustable tip, so that I can fan the flame out, or concentrate it. I’ll post about it when I’ve found one that I love. This entry was posted in beeswax, encaustic, encaustic technique, painting, studio and tagged beeswax, encaustic, encaustic painting, encaustic technique, encaustic torch, fusing, heating wax, microcrystaline wax, using a torch on May 5, 2009 by LisaK. I just finished this itsy-bitsy piece the other day. It is for a project directed by Saije Bashaw, at The Creative Gym 5. The idea is to create an art work inspired by a word or words, and taking between 1-8 hours to complete the project. Very simple, very fun. The words this time around were “hidden” and “change”. This little piece took me a few hours, and got me to do some visual problem solving, and felt refreshingly different from other recent work I’ve made. The deadline isn’t for a while, so I haven’t seen other’s work yet, but I’m looking forward to it. One….. Dot….. At….. A….. Time. This entry was posted in beeswax, encaustic and tagged beeswax, encaustic, inspiration, new encaustic paintings, painting on March 9, 2009 by LisaK. We have a chilly, rainy day here in Half Moon Bay, and I just went out and turned on the heater in my studio. I’m nursing a cold (*sniff*), but am still hoping to get a little work done. I’m working on a larger encaustic piece right now, another in the white series. This one is the other half of that hollow core door that I sawed into pieces a while back. When I’m working on larger pieces, I find it helpful to break down work sessions into smaller chunks. An hour, or two. 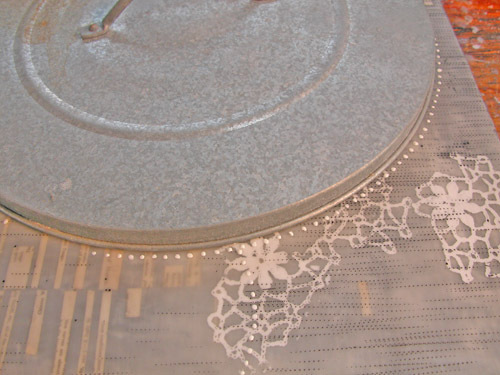 Just getting a single layer on there, and fusing it can take over half an hour. Whew! And here are three acrylic paintings waiting for some embroidery thread… I am especially happy with the grey one. This is a terribly wonky photo- my camera shoots wide angle whether I want it to or not- and the texture just didn’t show up, but I almost always like what happens when I restrict my pallet. I’m funny about color. I’ll tiptoe my way out on some colorful limb, and then always come back to my neutrals. I hadn’t done a nest yet with such somber colors, and I like the way it turned out. 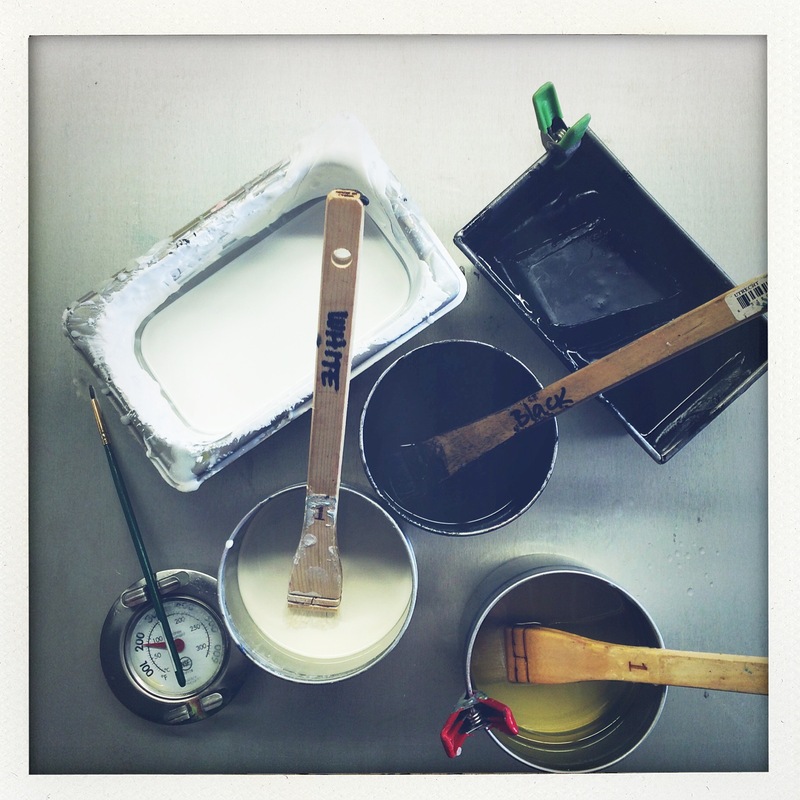 For those of you who are looking for information on encaustic technique, check out Malissa Martin Wilkes’ blog. She’s got some great information and photos, some studio shots, etc. Her set up is a little different from mine, and it’s good to see how different people work. This entry was posted in acrylic, beeswax, encaustic, encaustic technique, inspiration, nests, painting, studio and tagged beeswax, encaustic, nests, painting, studio, technique on January 2, 2009 by LisaK.